Mark Skwarek is a new media artist working to bridge the gap between virtual reality and the real world by using augmented reality technology. 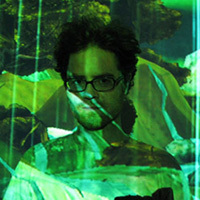 He is one of the founding members of the artist augmented reality group manifest.AR. Skwarek earned his M.F.A. from Rhode Island School of Design’s Digital Media Department. He teaches undergraduate and graduate courses at New York University Polytech, where he is also a researcher in residence. Reviews of his artwork have appeared in The New York Times, Art in America, Boing Boing, WIRED, The Boston Globe, and Leonardo. Skwarek has exhibited in various venues, including: the Institute of Contemporary Art, Boston; ISEA; the CyberArts Festival; the Sunshine International Art Museum, Beijing; and the Krannert Art Museum at the University of Illinois.